Indian fighter pilot Abhinandan Varthaman, who was recently released by Pakistan, has become a national figure, inspiring art, adverts and perhaps even a trend in facial hair fashion. His distinctive handlebar moustache has become so popular that many Indian men want to sport one just like it. The pilot became a national hero within hours of his capture after Pakistani forces shot down his fighter jet. He returned home to a rousing welcome on Friday. The pilot has since gone viral on social media with many Indians hailing his facial hair as a sign of valour. Amul, the country's most popular dairy brand which creates adverts based on social trends, made a video celebrating the fighter pilot's moustache. Handlebar-style moustaches are not uncommon in India, where they were once identified with flamboyant Bollywood villains, imperious military and police officers and even a notorious smuggler. But the reputation of the handlebar moustache appears to have been rescued over the past few days as it became synonymous with courage and patriotism. At least one hair salon in the southern city of Bangalore offered free haircuts and moustache-styling on Monday to anyone who wanted too look like the fighter pilot. 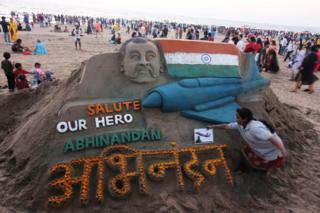 "Abhinandan has done so much for our country. I felt that I should try and make every face look like his," Nanesh Thakur, the salon owner, told BBC Hindi's Imran Qureshi. To his disappointment - or maybe relief - only three men qualified for the "Abhinandan" moustache. Tejas Chowdhary, who was one of the lucky ones, said he was doing it for the wing commander, adding: "He has done so much for our country, can't I do this much?" Naveen Kumar, an ambulance driver whose moustache also made the cut, said: "Abhinandan is a real hero, so I am getting a moustache like his." Several others were interested in the same look but, Mr Tahkur says, their moustaches were not long enough to be fashioned into handlebars - a style that is also known as "gunslinger". Instead, most men opted for a free crew cut, which is typical of military officers. Elsewhere across the country, some people tweeted photos of themselves sporting the moustache, saying they had been inspired by Wing Commander Abhinandan. Most Indians first saw the pilot on 27 February when Pakistan's information ministry released - and later deleted - a video showing him blindfolded and his face bloodied. In a later video he is seen sipping tea from a cup. He is not blindfolded and appears to have been cleaned up. He gives his name, military rank and says he is from "down south", but refuses to share any details about his mission, adding: "I'm not supposed to tell you that." The clip went viral with many praising him for his calm demeanour and courage. Soon, the hashtag #BringBackAbhinandan was trending and Twitter was flooded with prayers for his safe return. Crowds waving the Indian flag thronged the Wagah border in Punjab state, where he was handed over to Indian officials on Friday. News of his return was greeted with fireworks in several Indian cities, including the capital Delhi.